Stratospheerius will release their fifth CD “Guilty of Innocence” through Melodic Revolution Records early Fall 2017. The new 10-track album will be available worldwide in both Physical and Digital formats. “Guilty of Innocence” features special appearances by Alex Skolnick (Testament), Rave Tesar (Renaissance) and Randy McStine (The Fringe). “Guilty of Innocence” highlights include a reimagined cover of Muse’s “Hysteria,” a 12-minute prog epic titled “Soul Food” which features many of the guests mentioned above, plus “Dream Diary Cadenza,” a solo electric violin extravaganza lifted from Joe’s electric violin concerto. Melodic Revolution Records is more than just another independent record label: we are a family of individuals and musicians that work hard together like a well oiled machine, bringing the music listener, music that inspires, and makes us think, while cultivating memories – music that will stand the test of time. It is through this family atmosphere that new collaborations have evolved to create a rich blend of dynamic new music. As a renowned violinist, Joe has recorded/performed with Ritchie Blackmore, Bruce Springsteen, Sheryl Crow, Trans Siberian Orchestra, Peter Criss, Jazz at Lincoln Center, NYC Ballet (electric violin soloist), Phoebe Snow, Les Paul, Renaissance, and Mark Wood to name a few. He is an active teacher/clinician and published his book, “Plugging In: A Guide to Gear and Technique for the 21st Century String Player” through Mel Bay in 2012. He also recently world-premiered his “Dream Diary: Concerto for Seven-String Electric Violin and Orchestra” with the Muncie Symphony in 2015. 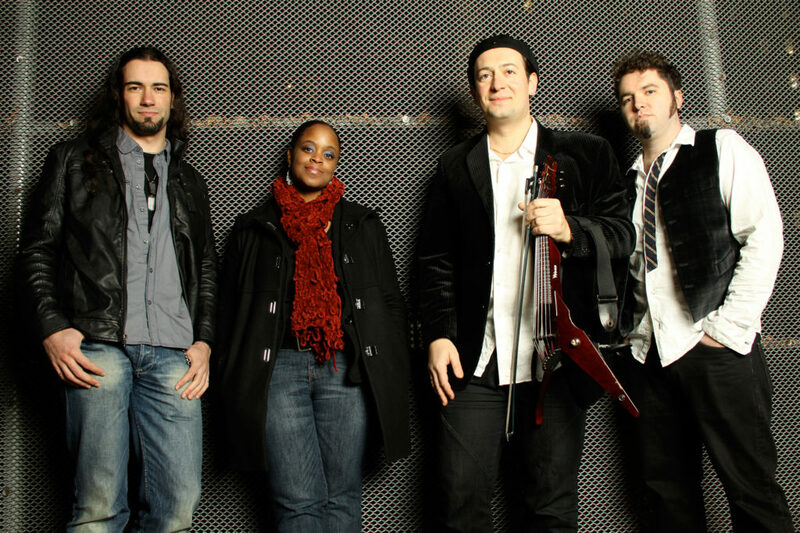 Stratospheerius has showcased their “frenzied melange of progressive rock, jazz fusion and funkabilly” throughout the world at colleges, festivals, and clubs. They have opened for artists including Alex Skolnick, Martin Barre, Tim Reynolds, Mickey Hart, Mike Stern, and John Scofield. The band was a winner of the John Lennon International Songwriting Competition the Musicians Atlas Independent Music Awards. They have been featured in Progression, Relix, Downbeat, and Jazziz, among other publications. Further Information Can Be Found At. What the critics have said. “Joe Deninzon brings the process of bringing the violin into the 21st century by making the music and technology of the contemporary electric guitarist available to the curious and willing violinist.